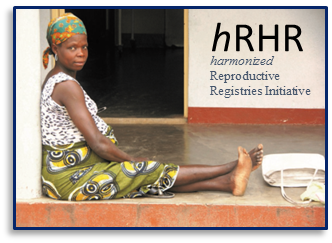 Overview of the harmonized Reproductive Health Registries (hRHR), a global initiative to improve data quality and data collection techniques for maternal and child health. The harmonized Reproductive Health Registries (hRHR) is a global initiative to improve data quality and datacollection techniques for maternal and child health. The overall aim of the hRHR Initiative is to reduce maternal and infant mortality – by facilitating the introduction of reproductive health registries for better governance, targeting, health surveillance and accountability of public health initiatives in reproductive health. Many countries and organizations around the world are struggling to improve their data sources. Unfortunately, they are not harmonized with each other, which leads to enormous waste of resources, inability to compare and collaborate, and poor data quality, leading to misled efforts and initiatives. Core reproductive outcomes, such as neonatal deaths and stillbirths, are examples of issues being left invisible and not prioritized globally. Data on health outcomes and care provision is essential to monitor and evaluate the implementation of health initiatives, and to enable further improvements and accountability towards society. Without a measurable problem, solution, and target of improvement, societies cannot prioritize their resources and, without accountability, no solution is sustainable. The objective of the hRHR Initiative is to develop a framework with ready-made toolkits to save time, resources and capacity needed for countries to establish and utilize data collection throughout the continuum of reproductive, maternal, neonatal and child health (RMNCH), using health registries as an intervention. HeLEX is responsible for WP1 – Ethical, Legal and Societal Impact (ELSI): We are developing templates and check-lists ensuring that registries are developed, governed and used in an ethical and lawful manner respecting international regulations of the individual’s rights and privacy protection, societies’ needs, and research ethics. The hRHR Initiative is led by the Department of Reproductive Health and Research (RHR)/ World Health Organization (WHO) and the Norwegian Institute of Public Health (NIPH) and is funded by the Norwegian Agency for Development Cooperation (Norad).